"From practical wedding information on hair, makeup and styling to holistic health, meditation and exercise, Ms. Weithorn's book is a great resource for the bride-to-be." "My nephew's fiancee wrote me and said she found the book very calming--she didn't know why and that it was a good read..."
Celebrity makeup artist Rochelle Weithorn prepares today's Bride for her Wedding Day by showing the way to orchestrate a joyful celebration while remaining beautiful throughout that eventful day. Weithorn, a stylist and facilitator who specializes in brides and celebrities, combines sophistication with a holistic emphasis. With a background in meditation and the healing arts, she calls herself an enhancer of the Bride's natural qualities. Be Beautiful (And Stay Sane) On Your Wedding Day is divided into four sections. 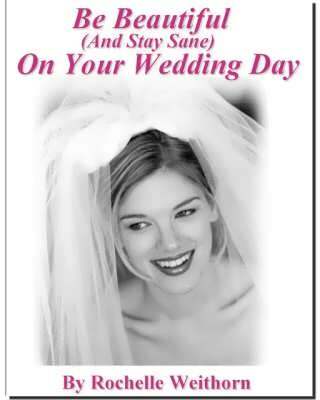 The first provides practical information guiding the Bride through all of the events and details of her Wedding Day. The second section gets her in shape through health, meditation and exercise. The third outlines a variety of cogent beauty advice including step-by-step "how-to" makeup and hair tips geared for the Bride. The final section becomes a sourcebook indicating how and where to find everything recommended in the book. Be Beautiful (And Stay Sane) On Your Wedding Day is a resource for the Bride that broadens her communication with everyone concerned: from the florist to the photographer to the Groom, himself. The book — laden with tips and examples — covers the gamut of all that a wedding entails, enabling the savvy Bride to emerge with confidence and heartfelt beauty to fully enjoy her ultimate spotlight. Ms. Weithorn works as a Hair and Makeup artist in New York City and travels extensively working with Brides to ensure they look their most "Beautiful" on their most important day -- their Wedding Day!